Mark your special event with the release of pure white doves, a symbol of quiet innocence, a symbol of peace, and of love and devotion. Throughout time, doves have been used in ceremonies and special events to commemorate the moment. Many cultures believe that these beautiful creatures offer a symbol of faith, love and devotion, as well as a symbol of peace, hope and eternal life. 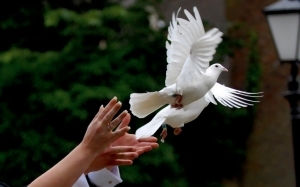 A White Dove release is the perfect added touch to any ceremony. At Celebration Doves, we are committed to making your special day even more unforgettable. 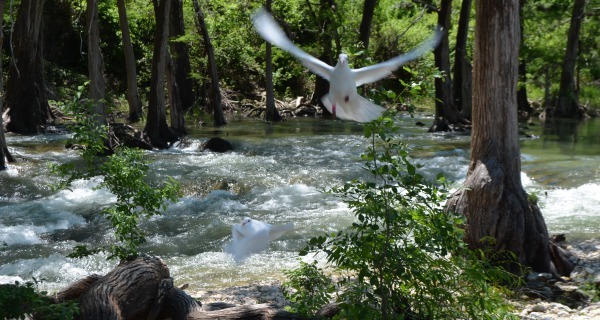 We offer white dove releases for special events such as weddings, Quinceaneras, anniversaries, proposals, graduations, funerals, memorial services, and other special events. Seeing white doves soar into the sky and circle above provides a spectacular experience for all those present. Dove releases help make that special day even more memorable in an everlasting and emotional way that is certain to tug at heartstrings for years to come. We are a small privately owned aviary housing pure White Homers located in Wimberley, Texas. We are able to offer releases within a 60 mile radius of our loft. We take great care to safeguard the health and happiness of our flock. Our birds are provided the opportunity to fly daily (weather permitting) in order to help guarantee their happiness, well-being and conditioning which is critical to their safe return home. We take into consideration the time of day, the location and weather conditions prior to allowing our birds to fly in order to ensure their safe return. We work with local venues to provide dove releases.